Psychologist Jennifer Van Wey explains how the brain can benefit from a progressive training regimen. Are you easily distracted? Do you have trouble putting names to faces? Are you prone to losing your keys, cellphone, glasses or wallet, or walking into a room in your house and forgetting why you were there in the first place? Once we reach our 40s, our brains start to shrink — literally. It's microscopic atrophy, a normal part of aging. But if you're worried about staying sharp, a little regular exercise can keep your mind agile, healthy and strong. A growing body of evidence suggests that engaging in frequent mentally stimulating activity can improve "executive functions," like working memory, processing speed, mental flexibility, and verbal fluency, and even reduce one's risk of dementia. 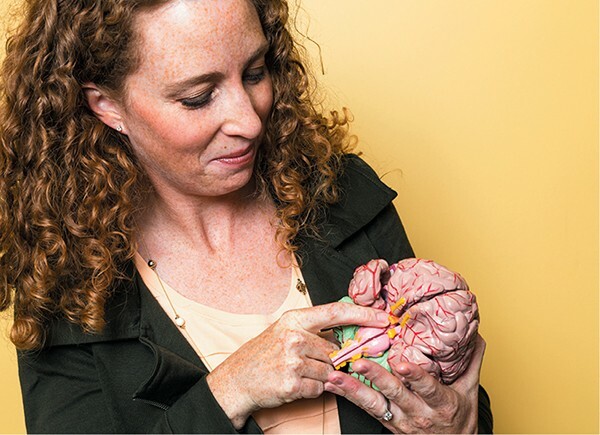 "Your brain is like a muscle," says Jennifer Van Wey, a psychologist with the Spokane-based Northwest Neurobehaviorial Institute. "You want to work it out." Brain training games have become a multimillion-dollar business. Lumosity, one of the most popular online brain training programs, has grown dramatically since it was launched in 2005 and now boasts 40 million subscribers worldwide. A Stanford University study published in May found that breast cancer survivors who had undergone chemotherapy showed "significant improvements" in various cognitive functions after playing Lumosity games over 12 weeks. Mickey Brown, 60, a Spokane developer, logs in to Lumosity and plays for 15 minutes every morning with his cup of coffee. In 2004, Brown was a victim of a serious motorcycle accident outside of McCall, Idaho. He remembers waking up "six weeks later and 75 pounds lighter" at Seattle's Harborview Medical Center. "Everything was broken," he says. A medically induced coma significantly hampered his ability to remember. For about two and a half years afterward, his memory was spotty. He started using Lumosity about a year ago and has noticed his memory and attention improve. "My short-term memory loss was profound and long-term memory was affected. I'm finding now that it is helping me," Brown says. "When I set something down or put my keys somewhere, I remember. We all take that for granted." Lumosity measures your "brain performance index" based on your results in training games targeting specific cognitive abilities, such as attention, problem solving, memory, mental speed and flexibility. With Lumosity, you can create a "personalized training program" tailored to the brain functions you'd most like to improve. Various exercises test your capacity to process information, remember names and objects, or solve equations. The games progressively adapt to your skill level, so as you get better, the games become more difficult. "It's rehab for the brain," says Brown. "I'd recommend it to anyone, particularly anybody who enjoys mental challenges." The Northwest Neurobehaviorial Institute offers its own brain training program for those who'd prefer in-person instruction. "Brain Boot Camp" is a three-hour interactive course on Mondays and Fridays for people who want to improve their visual and verbal memory. In addition to teaching strategies for remembering things like names and faces, the course also emphasizes the importance of stress reduction, exercise and healthy nutrition in enhancing one's memory. Your brain's an organ and these are protective factors, Van Wey explains. Chronic physical and mental health problems exacerbate cognitive decline. "Those three things are absolutely crucial," Van Wey says. "There's a lot of good evidence, not just anecdotal evidence, but a lot of good evidence that people who have been unhealthy with their eating, who are overweight, who are very stressed, who don't sleep well, all of the sudden make some big lifestyle changes, and their brain health improves dramatically." For brain games, Van Wey recommends a program called Dakim BrainFitness, geared toward adults 60 and older, because it boasts proven results from a UCLA study. But, she says, regardless of the game or program you use, "it's good to do anything to keep your brain active." And a routine is important.